I've got to try to get up into the Oregon side where you went. Dale - I've actually been there before early in the season and the stream does not change much other than for the cows...Check out my cuttslam post it is the same stream and place. Some of those small creaks are remarkable for their flow consistency and water temps. But like I intimate in my post, downstream it is a much more fun creek to fish and the road out to the north is better than the one coming in from the GL side. Also, as you write in your HTC post, the road out to "dozen" is bad. I would not drive it without at least two spare tires. Cool post on your HTC trip and I particularly like the LK Golden pic from the LK. 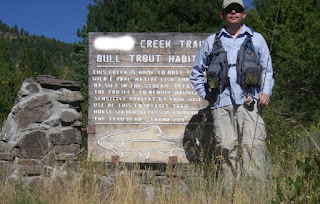 Looks like you had a good trip Dave, I still stand by it that that stream with the bulls is the most difficult creek that I have ever fished... Looks like it treated you well though nice job! !